Trailers, eh? I’ve been fooled once or twice in recent memory. Not that I go to the cinema all that often, but I did catch a couple of trailers for The Bookshop, liked them and thought I’d go and see the film when it came. I’m almost certain it never came. Not here. And that’s interesting in itself. Why ‘trail’ a product you won’t be selling? When Daughter was last here she assisted the old folk – that’s us, the Resident IT Consultant and me – by compiling a Netflix list of films, making them easier for us to find. And urged by positive noises on social media, we watched The Bookshop a few days ago. It had Bill Nighy in it. Not many films don’t, these days. I like Bill. He was good in this one, as well, even if he only ever has the ‘Bill Nighy’ setting. His face after reading Fahrenheit 451..! The thing is, while it was a pretty decent film, it was nothing like the trailer had led me to expect. I don’t know the book by Penelope Fitzgerald, on which it was based. On the one hand it was another of the popular retro settings, travelling back to the 1950s, and a seaside bookshop being set up by book-loving widow is quite an attractive idea. On the other hand, there was much nasty behaviour by her neighbours – made worse by today being 2019 – and she was far too kind and polite, as well as perhaps a little naïve. Her helper, played by Honor Kneafsey, was refreshingly observant and outspoken for someone so young. And being me, I couldn’t help but pick holes in the authenticity of the retro-ness. But apart from expecting a different film, it was good. Not cheerful, so much. This entry was posted in Authors, Books, Bookshops, Film, History and tagged Bill Nighy, Emily Mortimer, Honor Kneafsey, Patricia Clarkson, Penelope Fitzgerald, Ray Bradbury. Bookmark the permalink. Hello! 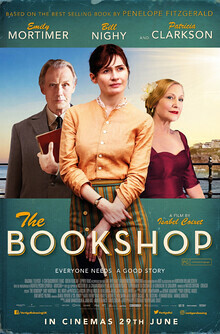 I saw this film soon after I’d read The Bookshop novel. Now, I really liked the novel, partly because it drew on Fitzgerald’s own experiences of working in a bookshop in Southwold, a setting I know quite well. I was a little sad to find the film (filmed in Ireland) was set somewhere “elsewhere”, away from those wide sea-marshes and skies. The film was also, in comparison, fairly gentle: the book is bitterly clear-eyed about the worst side of the plotters and schemers in a small town community, and the end not even as easy as in the film. But, but, but . . . I really did like the book – despite the hurts that happen as part of the innocent heroine’s life-lessons – and Fitzgerald’s writing does capture a certain grimly realistic humor that comes from the all-too-human mis-managed hopes and situations. Definitely it’s the kind of book to read when you are feeling strong and have nice things planned and good people around you, and maybe some chocolate or similar on hand as well. Though Bill Nighy did, of course, add to the film, although maybe more romantically than in the book. Oh dear. Now you’ll probably never read Fitzgerald’s own “Bookshop”, will you, Bookwitch? But I’m pleased to hear about the book and your thoughts about both. It was really that the blasted trailers sold me a much happier idea of the story.